In cooperation with the Delegation of the European Union to BiH, Initiative for Monitoring the European Integration of BiH organized a round table discussion on the topic “The Current State of the European Integration Process of Bosnia and Herzegovina“. 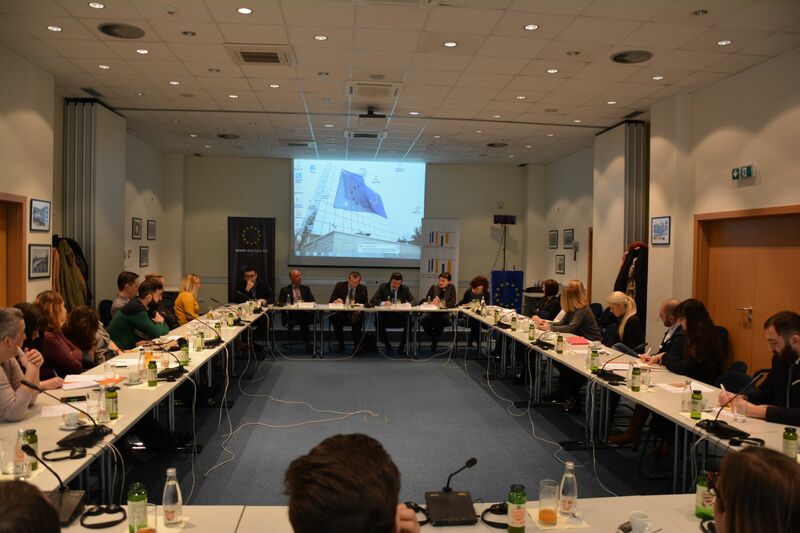 The round table discussion was held on January 11 at EU Delegation to BiH premises. The key speakers where: Khaldoun Sinno, Deputy Head of the EU Delegation to BiH; Cristian Dan Preda, Member of the European Parliament and Standing Rapporteur for Bosnia and Herzegovina; Nikola Lovrinović, Member of the Parliamentary Assembly of BiH and Chair of the Joint Committee on European Integration in 2014-2018 convocation; and Tijana Cvjetićanin on behalf of the Initiative for Monitoring the European Integration of BiH. At the opening of the round table discussion, the Deputy Head of the EU Delegation to BiH, Khaldoun Sinno, pointed out that regardless of the complexity of a country, any country that wants to join the European Union must be able to cooperate coherently and coordinated with the EU. He added that the rule of law is a key issue that Bosnia and Herzegovina will have to deal with in the continuation of the EU integration process. The Stabilization and Association Parliamentary Committee (SAPC) was discussed at the round table, and it was pointed out that the fact that the Parliamentary Committee did not adopt the Rules of Procedure after three years is considered as a violation of the Stabilization and Association Agreement. Without the Rules of Procedure, the Parliamentary Committee was unable to arrange meetings and work. Another topic discussed was how much is the voice of the institutions of Bosnia and Herzegovina in Brussels being heard. It is problematic that Bosnia and Herzegovina has not yet appointed the Head of Mission to the European Union, while EU has the largest delegation in the world stationed in BiH. This is one of the reasons why EU officials in Brussels cannot achieve adequate communication with BiH institutions. The European Parliament’s Resolution on BiH was also a discussed topic, since the Resolution was not set on the agenda of the European Parliament’s plenary session due to the failure of the SAPC. The key messages of the Resolution will be that there is an increasing political division on ethnic lines in BiH, that there must be and end to the glorification of convicted war criminals by officials, and that BiH must decide between accepting the influence of foreign powers and partnership with the EU.